With a whole new year upon us, many fashion lovers are going to re-evaluate their personal styles. If you are thinking about how to revamp your wardrobe, adding trendy color to your everyday look is the best way to be fashionable and stylish. Looking for your stylish look? Read this before you shell out on loads of new clothes. Every season, fashion experts at the Pantone Color Institute reveal their chosen color of the year. They hold secret meeting twice a year bringing together experts in color standards groups. Their choice of color historically influences trends in all facets of design. Peachy orange shade known as Living Coral will be the next big thing next year. Its palette of shades is extraordinarily rich: from delicate shade to passionate red-orange tones, this trendy can make you feel like a million bucks. No matter how you put it on, it really is a hot color this season. A softer version of orange, coral can be worn by most people regardless of skin tone. If you still haven’t chosen your shade of coral, here are some easy ways to do it. Take note and get ready! Choosing your color scheme can be difficult. Mapping colors to your clothes is as much science as it is an art. So, let's first determine your skin tone. In general, there are two basic types of skin tone: warm and cool. Warm complexions have yellow undertones, while cool complexions have pink undertones. Choose the wrong shade and you can end up looking lifeless. If you're still unsure about your skin tone, look at the veins in your wrist or ankle. If your veins appear blue or purple in color, you have a cool skin tone. Those with warm skin tone tend to have green veins. Some people can't determine their skin tone. Their veins are a mix of green, purple. If you have both blue, green or purple veins you may have a neutral skin tone. Make the process of choosing a color easier by picking the color shades that complement your skin’s natural tones. Delicate coral hue will look good on both white and tanned skin. It goes well with jewelry made from pearls and turquoise. When you already feel like a pro in yellow fashion, be creative and mix and match it with white, yellow, peach, dark lilac and brown colors. Peach color looks good on golden skin. This color shade is good for both office and leisure. You might like the combination of a coral pale peach color with yellow-gold, maroon, olive, lilac and white colors. Neon coral color is gorgeous. It is perfect for blondes with light or golden skin. Match it with yellow and gold, dark blue, pink and gray. Deep rich coral help you look your best for any special occasion. This magnificent coral hue will add a touch of class to your look. It looks absolutely amazing on brown skin. Perfect make-up is all about the colors you choose and where you put them. A coral shade lipstick brings a soft warmth and glow to the face. It looks fresh and youthful on any skin tone. 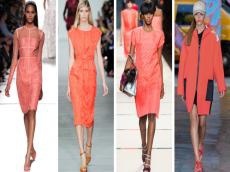 From bold to pastel ensembles, these stylish ideas will teach you how to wear coral color without clashing. The coral hue is sure to spark all design trends.